Price includes choice of authentic Thomas Kinkade frame. "A gate is an invitation to explore! I spotted this gate while driving through a tiny Cotswold village, having just painted McKenna's Cottage. I knew at once I must record the gate in paint, yet since daylight was escaping, I quickly snapped a few reference photos and vowed to recreate the gate in my studio. Funny enough, while taking photographs of the gate, I had become distracted by a man tending to a burning pile of leaves and never even attempted to see what lay up the road. So now, your guess is as good as mine!" 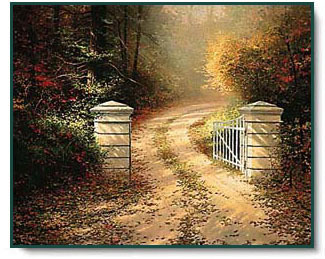 The Autumn Gate copyright© 1991 by Thomas Kinkade.